I wrote out this post last night, scheduled it for today, and when I looked at it... nothing I posted was there. I took Ian to the doctor today because he's been so sick this week and wasn't getting better. Turns out he has bronchitis. He feels terrible and seems to be getting worse and I've never seen him like this. I even called the hospital tonight to ask a few questions and they were very helpful. Tomorrow is Julie's birthday sleepover and I don't know how I'm going to handle all the prep work, baking (cake and cookies for decorating) as well as overseeing everything on my own. It's been a very busy week and I'm bone tired. 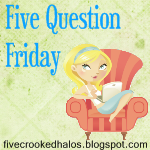 Today is Friday, which means it's time for Mama M's Five Question Friday blog hop. 1. What giveaway would you like to do on your blog? I'd like to give away a spa certificate. I don't think I'd enjoy a facial, and I certainly wouldn't want a massage and having some Stranger Danger rubbing their creepy hands all over my body. But... apparently the vast majority of people do enjoy these types of things, so I'd like to give that to someone. 2. If you had to choose between natural artistic ability and natural athletic ability, which would it be? But I can't do any of the above. I wouldn't want to have athletic abilility because then I'd have to do things like run. Ew. If you ever see me running, please call the police because there's a killer after me. 3. Do you ditch the coat the minute it becomes "spring" or are you a holdout for more cool temps? I hate wearing a coat. It's bulky and hot and I don't like it. I take one in the car with me in case I need it, but I seldom wear it. Ian calls it my Linus Blanket. 4. What would you do if you won the mega millions lotto of 1/2 billion dollars? I'd buy all new socks and underwear. And pillows. And then I'd travel the world with Ian and the kids. 5. You are at a hotel by yourself...what do you do? I need to savour that thought for a moment or two. I'd take a long, hot, bubble bath, put on brand new pjs, climb into bed and watch a movie while eating pizza from Pizza Hut. Posted by Kate at 2:40 p.m. I don't do spas either. And I wouldn't want other crazy people touching me for a massage. So I wouldn't enter to win your contest. But thanks anyways. I think I would like both talents. I'd like to be musical or artsy or athletic. Something besides somewhere in the low end of the spectrum on all.